ALL the birds at Paultons Park have been implanted with Micro Chips giving each bird a unique identity number. The Implant can only be detected by a Decoder and would require advanced micro surgery to remove. 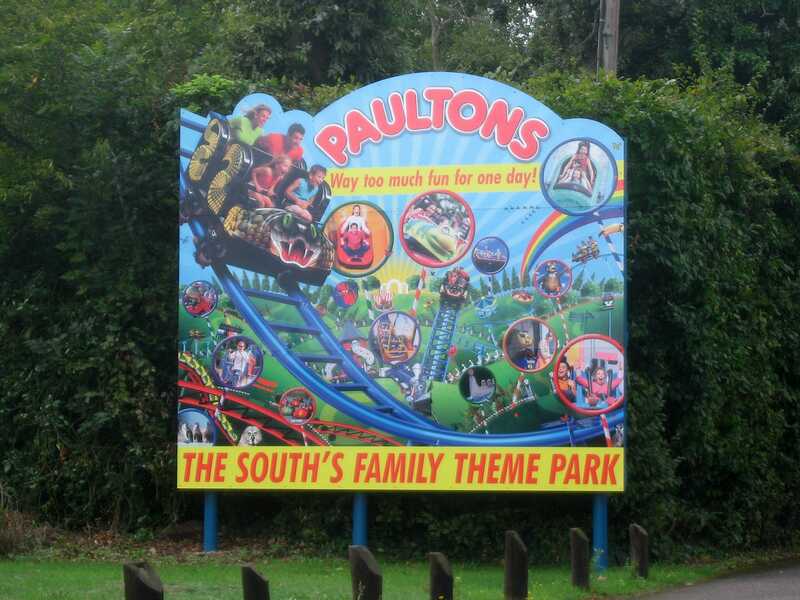 Should a bird be stolen, this system allows it to be positively identified anywhere in Europe as belonging to Paultons Park. My travels have brought me to many parks around the world with many interesting signs. Sometimes these were not intended to be amusing but poor translation has resulted in unintentional humour. However, this sign made me laugh for two reasons; first, it implies that theft of wildlife might be a problem in this particular area. Second, it advises potential thieves that they need only transport the wildlife outside the bounds of Europe to be immune from potential detection. One can only wonder whether a prosecution would result from a bird naturally migrating to another location. Anyway, humour aside, there was one primary reason for visiting Paultons Park today, and that was Cobra (#907), the latest of the so-called bobsled coasters from Gerstlauer. The only thing wrong with these rides is the name, as a bobsled refers to something completely different; the name wild mouse would be infinitely more appropriate. Be that as it may, this model feels much the same as the others; a good family level attraction, easy enough for children to enjoy while powerful enough for teenagers and adults too. In short, a winner. We rode both production coasters, Flying Frog (#908) and Stinger (#909), before happening upon a rather unique pair of walkthroughs. First up was based on the Wind in the Willows, with the whole story being told through music and animatronics. This was followed by a fascinating and in-depth exhibit on Romany Gypsies, which would not have been out of place in a museum anywhere in the world. It featured an impressive collection of artefacts as well as the occasional animatronic to hold the interests of the younger folks. Attractions of this calibre are rarely found in theme parks, and they are nice to see. The proximity of theme parks to airports is of great interest to me as a student pilot, as I hope to be able to fly myself to parks in the future. Adventure Wonderland is about as convenient as things get, with it being across the road (literally) from Bournemouth Airport. There's only one problem with this otherwise perfect idea; I can't foresee any reason why I would ever choose to go back there, as it is unequivocally designed for children only, with nothing of interest to anyone over the age of ten. Many might legitimately argue that this is a category that mentally fits me, but be that as it may, one ride on Wild Bill's Runaway Train (#910) was all I needed. The Hedge Maze was fun too, mind; I'd never done one of those before for some reason. It was a decent size which took a few minutes to get through. We also passed a bit of time watching Water Wars, a game of the highest sportsmanship and integrity. Or something like that. 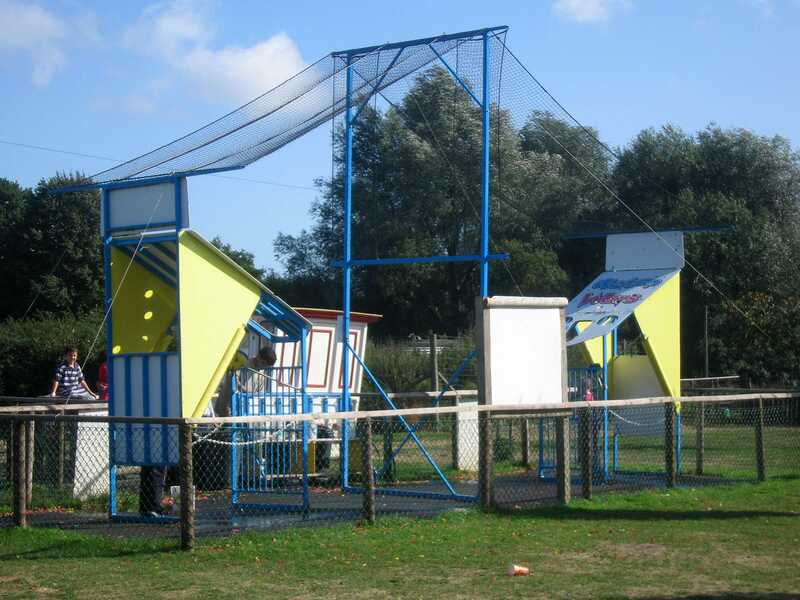 The basic premise is two cages, each fitted with a catapult mechanism. Protagonists are supplied with a number of water balloons, the objective being to hit your balloon directly above your opponent's cage, with predictable results. Participants are expected not to duck or leave their cage until their counterpart has launched all of their projectiles. This turned out to be extremely entertaining to watch, appealing as it does to the schadenfreude within us all; even the unskilled player got lucky occasionally. It was certainly more fun than the rather lengthy security queue at Bournemouth Airport.